Last year, Interfaith’s volunteers distributed more than 530,000 lbs. of food to hungry local families. The Pantry Shelf is open to clients Monday – Friday from 10-11:45am and Wednesday evenings from 5-7pm. 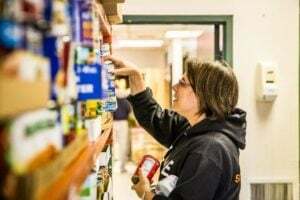 The Pantry Shelf is always in need of fresh produce, diapers (especially larger sizes – 4,5 & 6), baby wipes, hygiene items, and all types of nonperishable foods. We welcome your donations! Clothing and food donations are accepted Monday-Friday, 9am-3:30pm and until 7pm on Tuesdays and Wednesdays. Contact Interfaith’s Volunteer Coordinator, Paula Daniels. Download a pdf of volunteer assignment descriptions.